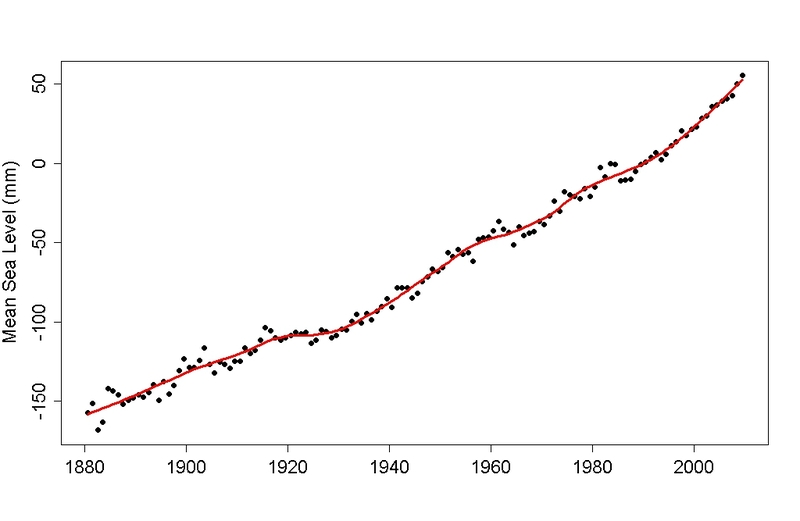 Looking at global data (rather than tide gauge records just from the U.S.) show that sea level rise has been increasing since 1880. 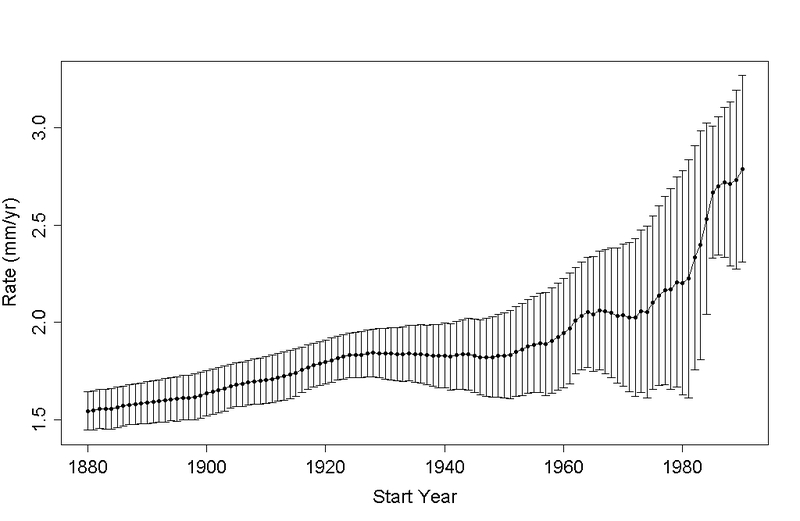 The recent rate of sea level rise is greater than its average value since 1930. As for future sea level rise, these predictions are based on physics, not statistics. A paper by Houston & Dean studies 57 tide gauge records from the U.S. (including Hawaii and oceanic territories) and concludes that sea level rise has not accelerated. In fact the authors seem to go out of their way to state that the average result shows deceleration at every opportunity. But there are some big questions about their analysis. Why do they use tide gauge records from just U.S. stations? Why not a global sample? Why use individual tide gauge records when we have perfectly good combinations, from much larger samples, which give a global picture of sea level change and show vastly less noise? 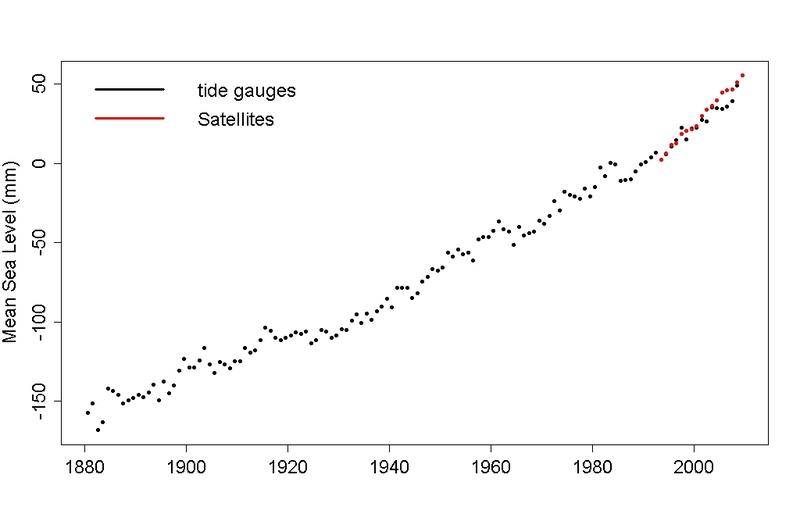 Why do they restrict their analysis to either the time span of the individual tide gauge records, or to the period from 1930 to 2009? Why do they repeatedly drone on about “deceleration” when the average of the acceleration rates they measure, even for their extremely limited and restricted sample, isn’t statistically significant? But the biggest question of all is: what’s the big deal? This is a global data set, and it’s a worldwide average so its shows vastly less noise than individual tide gauge records. We could even use it to look for acceleration or deceleration in sea level rise. But one thing we should not do is restrict consideration to the quadratic term of a quadratic polynomial fit from 1930 onward. That would be pretty ignorant — maybe even misleading. As so often happens, one thing to be cautious of is that the noise shows autocorrelation. 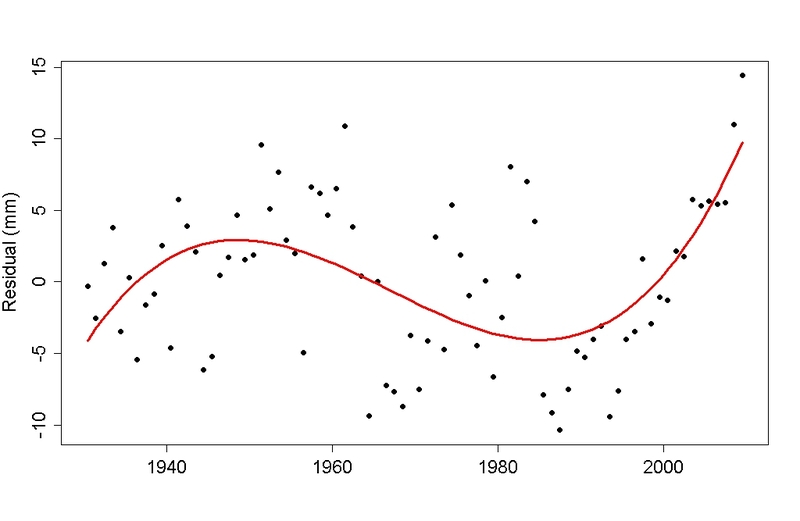 As Houston & Dean point out, the Church & White data since 1930 are approximately linear, so to get a conservative estimate of the autocorrelation I used the residuals from a linear fit to just the post-1930 data and fit an ARMA(1,1) model. 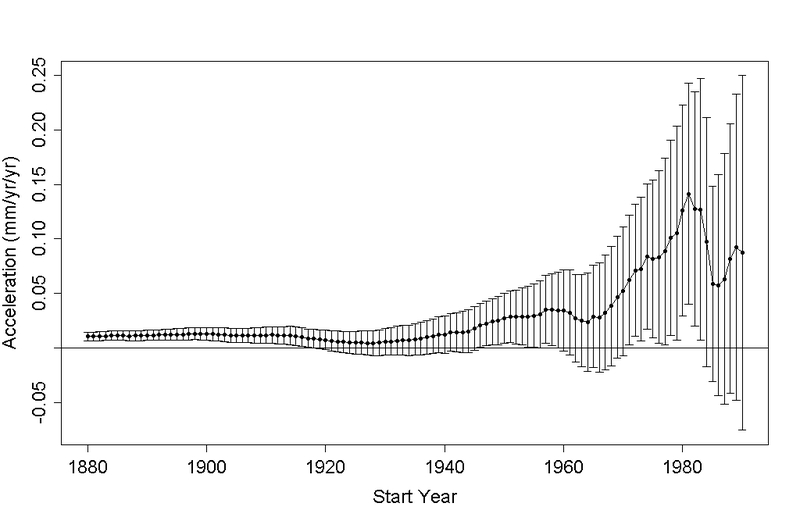 According to this, the recent rate of sea level rise is greater than its average value since 1930. Significantly so (in the statistical sense), even using a conservative estimate of autocorrelation. But the increase itself hasn’t been steady, so the sea level curve hasn’t followed a parabola, most of the increase has been since about 1980. How could Houston & Dean have missed this? Here’s how: first, they determined the presence or absence of acceleration or deceleration based only on the quadratic term of a quadratic fit. That utterly misses the point. 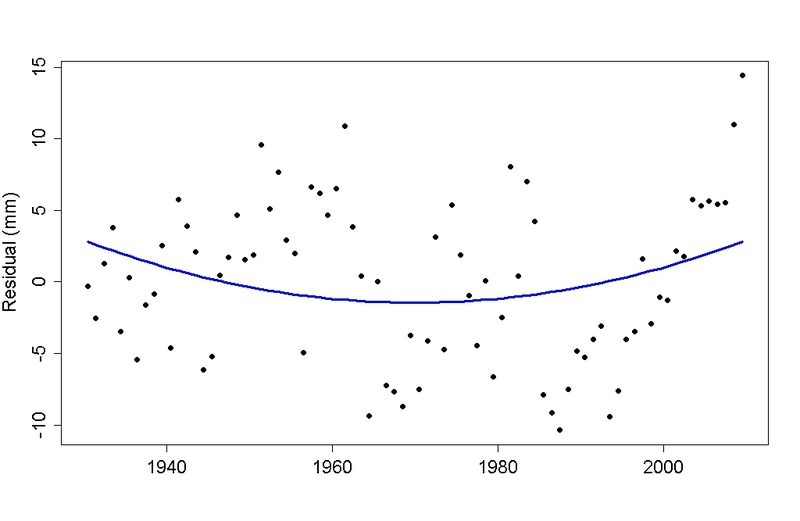 Changes in the rate of sea level rise don’t have to follow a parabola, since 1930 or any time point you care to name. In fact, by all observations and predictions, they have not done so and will not do so. Second, by using individual tide gauge records, the noise level is so high that you can’t really hope to find acceleration or deceleration of any kind, with any consistency. Not using quadratic fits, and certainly the non-parabolic trend which is present can’t be found in such noisy data sets. Well well … it looks like starting at 1930 is the way to get the minimum “acceleration” by this analysis method. Could that be why Houston & Dean chose 1930 as their starting point? Can you tell, just by looking, whether it curves upward or downward? Clearly, the parabolic fit doesn’t show much acceleration or deceleration, if any. We can get a better picture by first subtracting a linear fit, then fitting a parabola to the residuals? 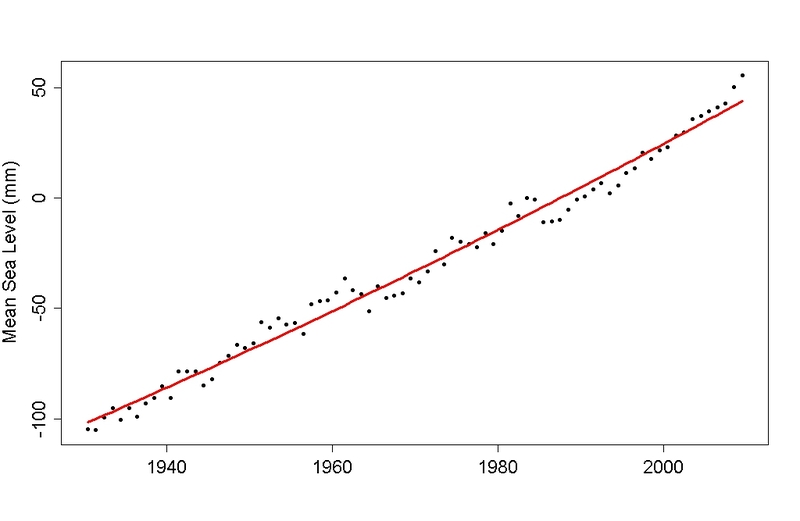 That answers the question: the quadratic fit shows acceleration in the Church & White data. But, when autocorrelation is taken into account, the “acceleration” is not statistically signficant. Well well … there seems to be change after all, with both acceleration and deceleration but most recently, acceleration. And by the way, this fit is significant. And now to the really important part, which is not the math but the physics. Whether sea level showed 20th-century acceleration or not, it’s the century coming up which is of concern. And during this century, we expect acceleration of sea level rise because of physics. Not only will there likely be nonlinear response to thermal expansion of the oceans, when the ice sheets become major contributors to sea level rise, they will dominate the equation. Their impact could be tremendous, it could be sudden, and it could be horrible. The relatively modest acceleration in sea level so far is not a cause for great concern, but neither is it cause for comfort. The fact is that statistics simply doesn’t enable us to foresee the future beyond a very brief window of time. Even given the observed acceleration, the forecasts we should attend to are not from statistics but from physics. Many thanks to Tamino from Open Mind for allowing us to republish his post So What?